Army ARO Recruitment Rally 2019 Of Soldier GD Bharti 2019 Clerk Openings in Indian Army Zone Bareilly Varanasi Lucknow GD Bharti Army ARO Recruitment Open Rally 2018. 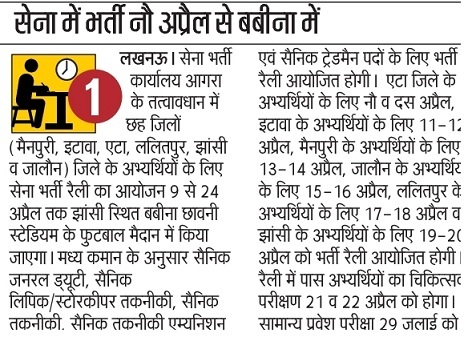 Army ARO Recruitment Rally 2019 Now Scheduled in UP District to Fill Indian Army Open Rally in Bareilly Varanasi Lucknow and Kanpur Zone. Registration Now started for ARO Bareilly (UP) Army Recruitment Rally 2018 as well as All Zones and States in India that we have posted in Indian Territorial Army Recruitment section. if you live in these three and want to get jobs as Soldier GD, Soldier Clerk/SKT, Soldier Technical, Soldier Tradesman than you must try UP Bharti Open Rally Lucknow Zone 2018. Below are some Important & Details information regarding UP Army Bharti 2017. Districts Wise - Mainpuri, Etawah, Etah, Lalitpur, Jhansi and Jalaun. Districts - Budaun, Bahraich, Balrampur, Bareilly, Farrukhabad, Hardoi, Lakhimpur Kheri, Pilibhit, Sambhal, Shahjahanpur, Shravasti and Sitapur. Soldier GD: 10th pass with 45% marks in aggregate and 33% in each subject. If you have passed 12th no percentage is required. Soldier Clerk/SKT: High school Intermediate pass in any stream (Arts, Commerce, Science). Soldier Technical: Minimum 50% Marks 12th pass in Science with Physics, Chemistry, Maths & English 40% Marks in each subject. Soldier Nursing Assistant, NA Veterinary - 12th Pass in Science stream with 50% marks in aggregate and minimum 40% in each subject. How to Apply: Intrested Candidates may visit Bharti Rally through website www.joinindianarmy.nic and make Indian Army Rally Registration up to 16 March 2017. Document Required: At Rally you will be checked with your document (verification) and provided Admit Card to download after 16 March. All Districts under ARO Varanasi:Gorakhpur, Deoria, Azamgarh, Chandauli, Varanasi, Jaunpur, Mirzapur, Sant Ravi Das Nagar/ Bhadohi & SonbhadraMau, Ballia, Ghazipur, Jaunpur, Sant Ravidas Nagar, Chandauli, Mirzapur and Sonbhadra. we soon update Admit Card, Syllabus, and Question Paper.